Stone and rock call out to a community and we become pilgrims. We go as individuals, trekking up or skipping down this mountain in the Blue Ridge chain. It calls your name. Its strong cold marble is strength. It is continuity. It knows stories. And It knows parts of mine. 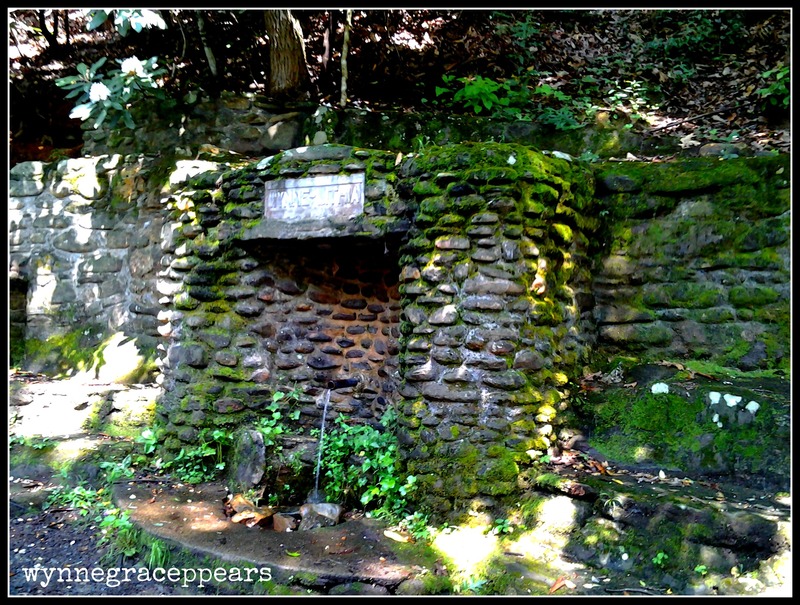 On any given summer day, sweet devoted visitors come and sip the water trickling from an underground spring. They come with jugs. They come with pitchers to fill up their vessels with cool earthborn water. It looks like a New Testament scene, or a snapshot from Africa or Haiti. People traveling with children, family, dogs to drink the water that is more than a drink for a parched mouth. It replenishes the soul with tradition. 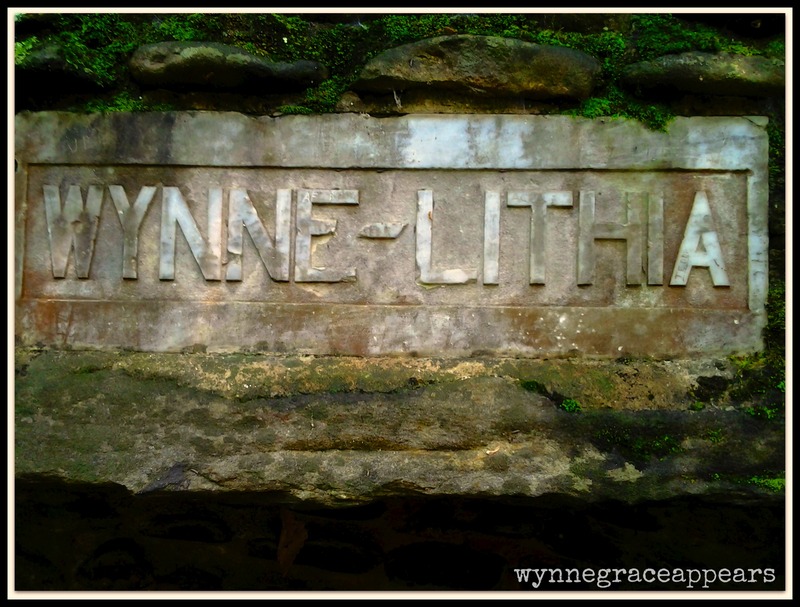 If stone could talk, this spring named Wynne Lithia could tell stories of watching children grow. For my family, those stories started when the spring was built in 1908. People will tell you their story of the spring, I am sure, if you will just ask. I met a woman who freely offered a slice of her life, tales which were tethered in memory back to the spring. It was our first meeting, yet the stories flowed off her tongue like the cool spring water from the old metal pipe. Why do we long to travel to a place of deep history and story? Where generations have laughed and sipped and gathered water.Why do we slip out after a summer southern supper to make one last visit to sip water and stand by the trickle in the cool of the night? Alone. Or with a child. What longing we must have for tradition to be pulled by a trickle of water, which for many means hiking up? For me and generations of my family it’s a rich well of deep longing after place. We, like many in this small community, can go back over the sepia-toned photographs of our people–at Easter, on a summer day, or dressed in their Sunday best–and dream of their stories. It began listening and witnessing family , children and women in long skirts dragging the mountain dirt path. They stare stone-faced in sepia into the camera beside their stoic men whose cool stares mimic the hard marble of the very spring they loved so. And you can line up generations of photographs which add to the story of the spring. They add narrative from generations before my own, like a mosaic of mountain memory. The spring’s rich story is repeated over and over by families in this mountain community and well beyond. The story of the spring and the need to return. Water draws us. It always does. We return home like Prodigals to be received, refreshed, restored — by the familiar, by comfort and consistency of the flow. Sometimes it is a strong pulsating rush up and down from below the earth. Sometimes it is a trickle, slow and faint. No strenth in the anemic journey out from the ground well from which it flows. But it is there. It is present. It waits. And it woos. If you are parched and if you are in need ,the water fills you and sends you on your journey.This place in the shade will always provide. If you are weary, rest waits here. And I draw lessons from this place, not only water. She teaches what it means to prepare the heart, to always be welcoming and available. She models how to sit quietly and expectantly, always prepared to welcome — always prepared to listen. She shows what it looks like to offer a refuge to family, to a friend to a stranger. Her strength and calm show how a peaceful spirit can offer a balm to a restless soul, how we can offer a quiet place of comfort to a broken world. She teaches how to give out of what we have, her flow may be strong, her trickle may be slight but she sits at her place on the mountain always prepared to offer what she has. And she offers what she is and what she has both to strangers and to familiar souls with a generous spirit. The spring gives all that she has, freely and abundantly. The spring that bears my name gives glimpses into what it looks like to be the hands and feet of Jesus, The Living Water. To serve a parched and hurting world. To love the lonely, the hurting and those in need of an ear to listen to their story. To receive their story. A trip to the spring reminds me to bend low in my day, to give freely of my time to others, to seek every opportunity to show hospitality, to release the gifts that God has given me back to Him. She was built in 1908 and is still strong and steady. I know only that I have today, to serve Him. And today is a good day to begin, anew. I am linking with these kind folks today. Jennifer and Duane. Glad you were here. Humble thank you’s from me to you. Grateful for this spring that bears our name. Looking forward to seeing my grandchildren stand there one day, with you. I love that your dad is here in the comment box. 🙂 … And he’s right. You’re a beautiful writer. Your kind words wrap around me today through this backlit screen. So glad to know you and that I am getting to know you more, friend, through this amazing community of writers. I loved your piece on Haiti and your closet. Spoke volumes to me. And the Haitian women are right, that blue dress is beautiful on you and you in it. I am humbled, DAF. And grateful for your eyes here and your heart too. That you are “renewed” “refreshed” and “challenged”, well to God be the glory. Thank you Sharon You here here is refreshing to my spirit too. Thank you for your presence. I am so glad you like this special place in my life. So beautiful! I remember stopping at springs on my hikes as a child. So refreshing, just like this post. And the parallel to the water Christ offers is perfect. And this, “I know only that I have today, to serve Him. And today is a good day to begin, anew.” Love. Thanks for sharing this today! Oh, it is a pleasure to have you here visiting. I hope you will come again. I am blessed by your kind words and humbled by them too. Your presence here is a gift. Beautiful post. The place sounds so lovely. Are you named after this spring? I loved reading about this place, but the comment from your dad, well, it just blesses. Thank you so much for your encouragement on my post, “Maximum Load”. Oh it was a pleasure over there at your lovely place. I hope for you rest. And yes, well my Dad—he’s a gift. I am so glad I happened upon your page and this poem after searching the web for more information on this spring! I used to attend the Montreat summer conferences with my Presbyterian church as a youth, and we stayed in the Henschen’s house just next door to yours. I haven’t seen that fountain in many years now. Perhaps I should make the drive to NC and stop by to see it again, soon.